In the face of stiff competition from today’s top-tier mirrorless interchangeable-lens cameras, DSLRs are not merely holding their own. In fact, they’re still the go-to choice for many serious photo enthusiasts and most working professionals. The reason they remain the enthusiast’s choice? they deliver an unsurpassed combination of awesome real-world performance and dependability in familiar form factors. In addition, they provide a full complement of advanced features. Equally important, they’re fully compatible with a wide range of pro-class legacy lenses. And users still are attracted to their robust, ergonomically contoured, well-balanced, weather-resistant bodies that look and feel like “real cameras” and have conveniently placed traditional controls. 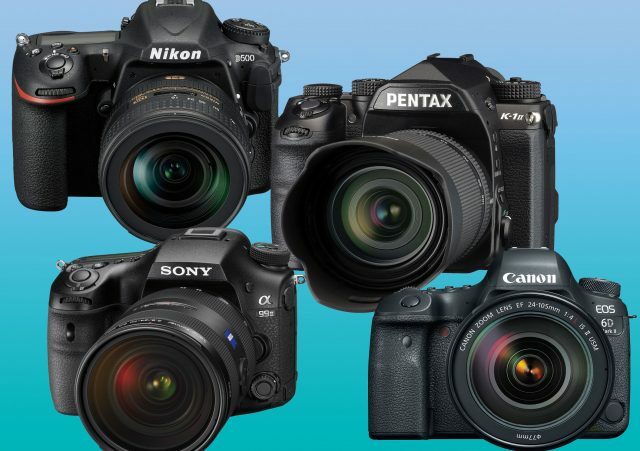 Indeed, the latest upper-tier DSLRs are the logical evolution of the species. Moreover, they’re classic examples of successful adaptation to a rapidly changing environment. In short, all eight superb cameras detailed here are as good as any in the world. That’s why they belong on the short lists of serious photographers that want to take their photography to the next level. Nikon’s formidable DX-format digital SLR set a new standard for the class with its 20.9 megapixel CMOS sensor (minus a low-pass filter) coupled to an advanced Expeed 5 image processor. As a result, it delivers a blazing full-resolution burst rate of 10 frames per sec, 4K UHD video recording at 30 fps, and a native ISO of up to 51,200. And sensitivity settings can be bumped up to an incredible ISO 1,640,000. Plus, an anti-flickering function aids in shooting under fluorescent lighting, as in gymnasiums. The D500 employs Nikon’s MultiCAM 20K 153-point autofocus (AF) system with 99 cross-type points to enhance AF speed and accuracy. It also features a large 3.2-inch, 2.36M-dot, tilting LCD touch screen for working at high and low angles. 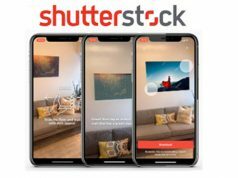 Furthermore, for the convenience of near-instant content transfer, it offers an updated version of built-in SnapBridge, which provides Wi-Fi, NFC and Bluetooth connectivity. 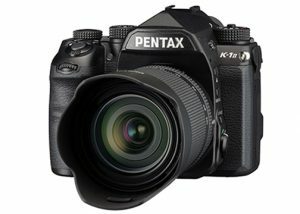 Pentax’s flagship, full-frame K-mount DSLR incorporates a new 14-bit image processor with a Ricoh-developed accelerator unit that reduces noise plus enhances clarity and color accuracy. It also boosts the camera’s sensitivity range up to an impressive ISO 819,200. Additionally, its built-in 5-axis Shake Reduction (SR) system minimizes the effects of camera shake and enables Pixel Shift Resolution II. This technology factors in the movement of the sensor to record sequential frames and merge them into a single image with greater color detail and higher resolution. The Mark II also incorporates an ultrahigh-res 36.4MP CMOS sensor and Prime IV processor from the previous K-1. The combo delivers a full-res burst rate of 4.4 fps for 17 RAW images. In addition, the camera integrates a AA filter simulator that minimizes moiré patterns, but it omits the standard antialiasing filter to ensure sharper images. Moreover, its wide-pattern SAFOX 12 AF sensor covers nearly the entire full-frame area and has 33 AF points. They include 25 cross pattern and three f/2.8-luminance points that can operate in light down to -3 EV. The DSLR further features a unique 3.2-inch, cross-tilt LCD monitor that tilts upward 90º, down 44º and 35º laterally. Other features include: dual SD card slots; Full HD 1080p video recording at 30p or 60i; and built-in GPS with an astrotracer function to minimize star trails during long exposures. Plus it sports LED-illuminated body points on the lens mount, card slots, back of the LCD and cable switch to facilitate low-light operation. It’s all built into a tough, weather-sealed body with a stainless steel chassis and magnesium alloy outer shell designed to operate in temperatures down to 14ºF. $1,999.95. Canon’s significantly upgraded full-frame model appeals to advanced enthusiasts because it delivers “the 5D experience” at an attractive price. 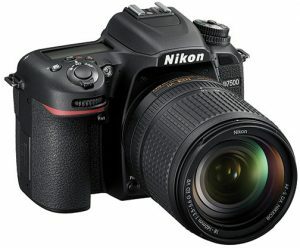 It has a new 26.2MP full-frame CMOS sensor coupled to a state-of-the-art Digic 7 image processor. They deliver a full-res, 6.5-fps maximum burst rate and can record Full HD video at 24/30/60 fps. Also employed are a 3-inch, 1.04M-dot, vari-angle, touch-screen LCD; a revised 45-zone, all-cross-sensor AF system; and a 97%-view, all-glass pentaprism viewfinder. It also offers built-in Wi-Fi, GPS and Bluetooth LE connectivity with NFC. Other features include: Dual Pixel CMOS AF technology; a movie servo AF function; built in time-lapse and HDR modes; 14-bit A/D conversion, in-camera RAW processing and JPEG conversion; and sensitivity settings expandable to ISO 102,400. This is all built into a robust, dust- and weather-resistant body. 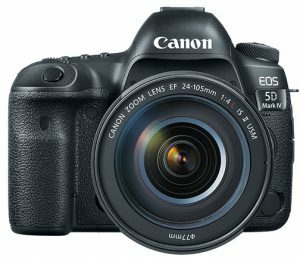 Its performance is sure to delight legions of enthusiast and pro Canon shooters wanting an advanced full-frame DSLR at a great price. $1,999. 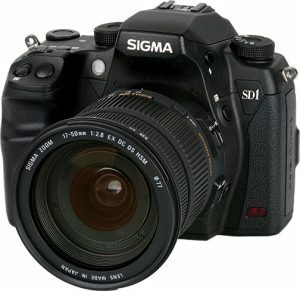 Sigma’s pro/enthusiast flagship DSLR features a full APS-C-format, higher-res, version of the unique three-layer Foveon X3 sensor. The sensor works like film to deliver full color information at each pixel location. Other upgrades include a Dual True II image-processing engine; an 11-point, twin-cross AF sensor; and a 3-inch LCD monitor. 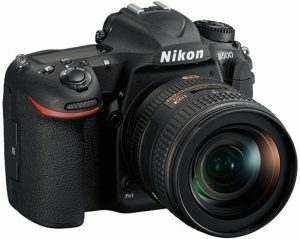 Key performance features are a maximum burst rate of 5 fps, ISO settings up to 6,400 and shutter speeds to 1/8,000 sec. While the SD1 doesn’t offer live view, video capture or tethering capability, it does deliver pro features like micro AF adjustment, three custom mode settings on the exposure mode (PASM) and an easily removable IR filter for infrared shooting. Where the flagship Sigma SD1 really shines is in its imaging performance, especially at lower ISOs, where it delivers film-like images with exquisite detail and superb color rendition. All these niceties are built into a magnesium body with O-ring-sealed buttons and enhanced weatherproofing. $1,799. This widely anticipated upgrade from Nikon is the first of its class to combine a 45.7MP backside-illuminated (BSI) sensor with no optical low-pass filter as well as a cutting-edge Expeed 5 image processor. Together they deliver a full-res burst rate of 7 fps that can capture up to 51 compressed, lossless 14-bit RAW files with full AE and AF. The DSLR also offers sensitivity settings that are extendable to ISO 102,400 and 4K UHD video recording at 30, 25 and 24 fps in full-frame or DX crop-sensor framing. The advanced DSLR uses a Multi-CAM 20K 153-point AF system with a choice of 24-, 72- and 153-point dynamic-area AF zones and fine-focus-tuning capability. Other features include: 8K and 4K time-lapse modes; a 3.2-inch, 2.36M-dot, tilting touch-screen LCD; a 180K-pixel RGB sensor; and a focus-shift mode that allows sophisticated focus stacking of up to 10 image layers. Moreover, its negative digitizer optimizes conversion of film negatives and slide images to high-resolution digital files. The D850 also provides full SnapBridge connectivity, including Wi-Fi and Bluetooth. Everything is built into a sturdy, dustproof, weatherproof body with a magnesium alloy chassis. $3,299.95. 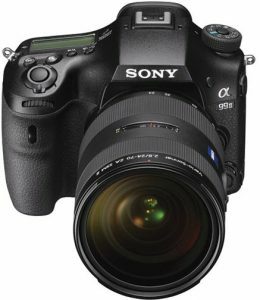 This impressively upgraded, pro-caliber camera from Sony has a fixed translucent mirror and a high-res electronic viewfinder (EVF) in lieu of a traditional DSLR’s optical viewfinder. Sony calls the latest flagship of the Alpha line a DSLT. Its Translucent Mirror technology enables full-time autofocus before, during and after the exposure. This is especially important when shooting HD movies or high-speed action. The a99 II incorporates a 42MP full-frame Exmor R BSI CMOS sensor that delivers 14-bit RAW output. It’s coupled to an advanced Bionz X processor with a front-end LSI. This innovation dramatically improves the throughput speed of the imaging system, enabling continuous 12-fps, full-res shooting with AF/AE, sensitivity settings to ISO 102,400, and internal 4K UHD video capture at 30/24 fps in the XAVC S format with S-Log3 Gamma and custom settings. The DSLT additionally features a hybrid phase-detection AF system that combines 79 hybrid cross AF points, providing both phase- and contrast-detection autofocus, and a 399-point focal-plane AF system located on the image sensor. It also incorporates five-axis SteadyShot Inside image stabilization for a 4.5-stop advantage in handheld shooting. Other features include: a 0.5-inch, 2.36M-dot OLED EVF; a 3-inch, 1.23M-dot, tilting LCD monitor; built-in Wi-Fi/NFC; and an S&Q motion function to record Full HD video at 1–120 fps. Sony’s flagship DSLT uses robust, lightweight magnesium alloy for the top and rear covers and chassis, as well as full weather sealing. $3,199.99. This is the latest version of Canon’s hugely successful EOS 5D series of DSLRs that are widely used by professionals and serious enthusiasts. It delivers exceptional image quality and fine detail due to its 30.4MP, full-frame CMOS sensor and Canon state-of-the-art Digic 6+ processor. This pairing provides DCI 4K (4,096×2,160) video capture at 30 fps, full-frame 8.8MP still grabs, and 7-fps, full-res burst shooting. Its native ISO of 32,000 is extendable from ISO 50 to ISO 102,400. Other features include: a 61-point high-density reticular AF system with an AF area select button; Dual Pixel CMOS AF technology; movie servo AF options; and Dual Pixel RAW, which allows users to fine-tune image parameters, including bokeh shift and micro focus adjustment after the picture is taken. 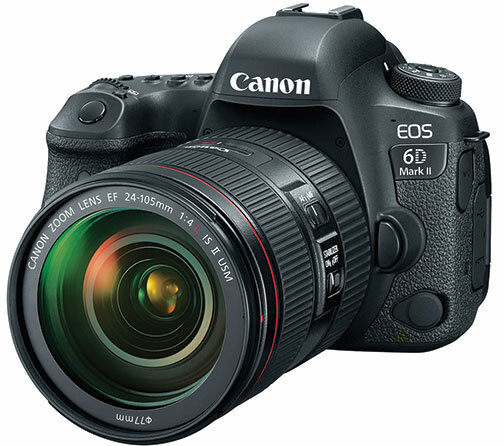 In addition, the 5D Mark IV has a 3.2-inch, 1.62M-dot, touch-screen LCD monitor to complement its bright pentaprism-type eye-level optical viewfinder. Moreover, it offers built-in Wi-Fi connectivity with NFC and GPS and has both CF and SD card slots. Its durable body has enhanced ergonomics that include a front-mounted N3 remote port, upgraded weather resistance and a mirror vibration control system to maximize sharpness in handheld exposures at low shutter speeds. $3,499. Designed to provide top-of-the line performance in a sleek, compact, ergonomically contoured package, this recently released Nikon DSLR incorporates many key features of the Nikon D500. The enthusiast-aimed camera does so in an attractive monocoque-constructed, weather-resistant body. 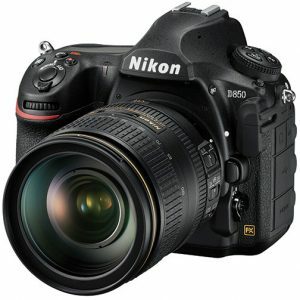 It employs the same 20.9MP DX-format CMOS sensor (sans the optical low-pass filter to enhance resolution) as the D500. The sensor also integrates with an advanced Expeed 5 processing engine. The result is a maximum full-res burst rate of up to 8 fps with full AE/AF. Moreover, there is a native sensitivity range of ISO 100–51,200 that’s expandable to an incredible ISO 1,640,000. Its robust multimedia capabilities include 4K UHD video capture at 30 fps. It also offers the ability to produce 4K UHD time-lapse movies in-camera. A 51-point, 15-cross-field-sensor AF system delivers outstanding AF speed and accuracy to enhance its impressive still and video performance. It also boasts a slim-line, tilting, 3.2-inch, 922K-dot, touch-screen LCD and a convenient auto picture control system. Other advanced features include Bluetooth and Wi-Fi for instant image transfer, sharing and remote shooting. In addition, it uses the same 180K-pixel RGB sensor as the D500 to detect faces and improve AF performance—especially when shooting high-speed sequences. $1,149.95. * All MSRPs are body only.